Chalk Pens are available in an assortment of colours or white only. Rainbow liquid wet wipe ‘chalk’ markers are rainproof after one hour, yet remain erasable with a damp cloth. 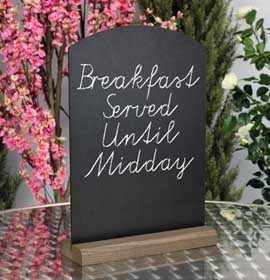 This makes them perfect for indoor and outdoor chalkboard messaging, and particularly effective on our Chalkboard Range and Chalk Insert Panels. Description All your Chalk Pens will be sent as individual units by parcel delivery. 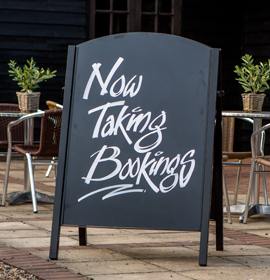 Your Chalk Pens will be sent in two separate deliveries – one by pallet, one by parcel. Rainproof after just 1 hour yet erasable with a damp cloth. Superior colour vibrancy and outdoor durability shown from our independent outdoor tests. Any staining following prolonged use can be removed using conventional household cleaning fluid. Top tip! Mr Muscle ‘Window’ is an excellent chalk pen cleaner. For use on blackboards, whiteboards and glass. *Contains red, green, white, yellow and blue.